BANFF, ALBERTA, Canada – Whether you’re a seasoned hiker or just getting started, spectacular Banff National Park in Alberta offers some of the best Rockies backcountry hiking available. Explore the diverse hiking trails in Banff, Jasper, Canmore and Lake Louise with our professional guides. Join one of our Banff Hiking programs and experience some of the highest quality hiking, trekking and walking excursions in the breathtaking provincial and national parks of Alberta and British Columbia, Canada. We’ve been running our guided mountain tours in the Canadian Rockies since 1977, so we’ve got experience on our side. 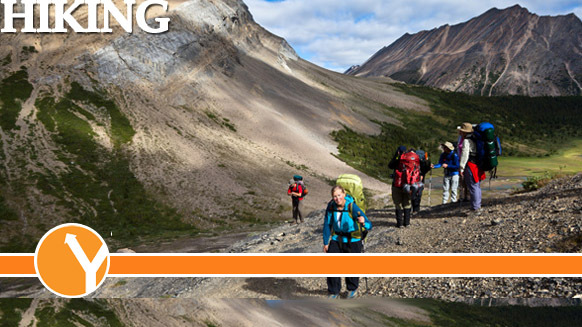 We offer single or multi-day hiking and backpacking adventures in Banff that teach you the fundamentals of mountain safety. Our outstanding guest services are among the best in the industry, thanks in part to our low guide-to-guest ratio. We offer a wide range of trips for all levels of skill and experience. There’s no better way to witness the awe-inspiring beauty of the Canadian Rockies than with our certified guides. We work hard to offer every guest a unique experience filled with challenges, incredible scenery and great memories. With over 33 years in the business, Yamnuska Mountain Adventures is the premier choice for beginner, intermediate and expert climbers looking for the best Mountain Guides in Canada. One look at our trip reviews and you’ll see why we’ve built up such an outstanding reputation among Canadian Rockies mountain guide companies. Our mountaineering programs and trips are world class, setting the industry standard year after year. Stop by our office in Canmore, Alberta and we’ll tell you more about our courses and programs in Alberta and British Columbia. Be sure to check out our Canadian Rockies Ice Climbing tours. Looking to experience the thrill of mountaineering, backcountry skiing, Rockies rock climbing, or ice climbing in Banff, Alberta? Sign up for one of Yamnuska’s premier programs today! As one of Canada’s best mountain schools and mountain guide companies we offer exceptional programs for beginners to experts. Watch this Yamnuska Mountain Adventures video and join one of our awesome Canadian Rockies hiking tours today! Banff National Park is hands down the most impressive park in the Canadian Rockies and home to some of the most amazing scenery in North America. Tons of Banff National Park’s hiking trails can be accessed from the town of Banff. When hiking in the Canadian Rockies, always consider safety first and be cautious of unpredictable weather, wildlife, floods, falling rocks, mudslides and other dangers.